Well not seen a rose in flower like this in January before and this rose called Phab Gold. It was named after the Phab charity in 1997 to celebrate its 40yr anniversary. There were quite a few roses still in flower in Regent’s Park but this one had by far the most blooms on! Spent most of this week pruning fruit trees and one of the joys for me while pruning is looking at the beautiful mosses and lichens growing on these trees. Hoping to learn their names a bit more next year. Talking about pruning fruit trees, here’s a large one I pruned this week, it’s a start of a 3 year plan on getting this tree back to a size and shape both me and the clients are happy with, already looking forward to it next year! Just seeing these snowdrops emerging from the depths of the soil once more, just lifts my mood completely, I do love snowdrops and look forward to seeing them out so much. This time of year can be so dull and long with the grey dull short days but there is so much going on and to look forward to seeing if we can allow ourselves to do so. This Swiss chard is nearly done now but is still adding colour to the vegetable garden. Clematis cirrhosa is starting to do its magic in a couple of my gardens, I love love this clematis. It’s a great plant to cover an area and it’s flowery sight is very welcome at this time of year! Such a great job with the watersprouts! I am truly impressed- am too intimidated by similar ones in our garden. Wish you could come over for a class! Great job on the apple tree. I have a similarly sized one that needs a professional prune – I’ve booked someone to come on Wednesday. I did prune the persimmon myself and the smaller apples. Your pruning guides are very helpful. And the Clematis cirrhosa is inspiring – one to take away and think about. Thanks. Also thanks to Chicu for making me think about water sprouts on apple trees! I need to look at my big apple tree again – I suspect those are what I need to have cut out. So much to learn! Ah. But see, reading Cass Turnbull’s book on pruning has made me wary of even looking at water sprouts, let alone taking pruners to them! Gorgeous Clematis this C. Cirrhosa (its color probably had to give its name…) ! And great pruning job. We can really see the difference ! Ah, splendid pruning. The tree is tall though. Picking fruit is a hassle up that high. I keep mine down, but it compromises abundance. Wot?!!! We have a hashtag!??? This means we now need to have an annual get-together somewhere. 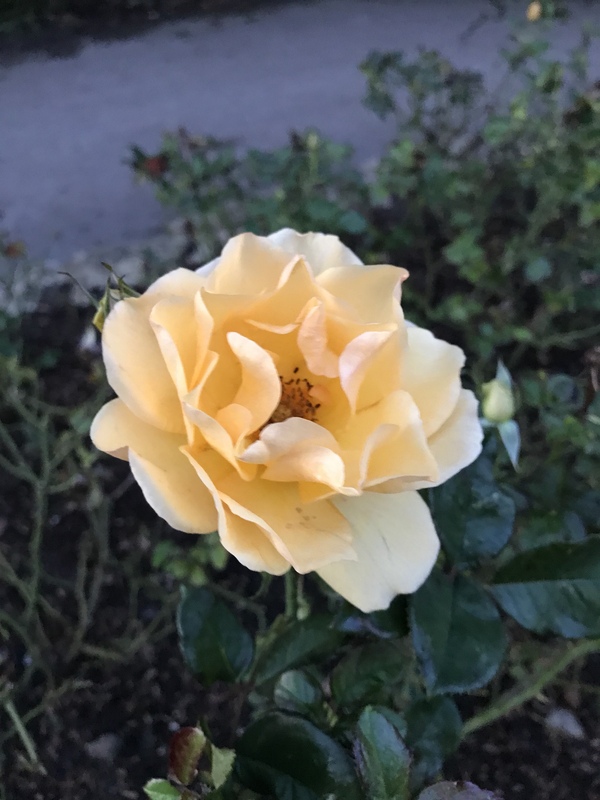 I didn’t know there was a rose named after Phab (I came out of my voluntary youth leadership training in the mid 70s straight into leading the Phab Club in Cardiff). I finally have no roses in bloom in the garden but do you know anyone who speaks Helenium? I’m beginning to worry that mine will flower themselves to death soon. They need talking to. Oh yes caught the end of a post by the Master so yes good hashtag to use! It looked a good rose as well, couldn’t believe it was flowering as much as it was. Ummm no sorry lol maybe see if you can find someone called Helen, she maybe able to talk to them? I enjoy pruning, although I prefer to leave too much climbing to others as I am a bit of a scaredy cat! Your tree looks great. Lichen is such a wonderful and mysterious thing. Love that clematis, very pretty. A great Six – beautiful rose, a new clematis to covet, apple pruning envy (your pruning blogs are going to make me forswear my foolish etcs), lichen to die for, & at last someone else’s chard I can compare mine to (me being a chard novice). Give me some vicarious pleasure & tell me you used a tripod ladder on the apple tree. I love the pictures of the lichen. Is it true that without lichen there would be no life on the planet? Probably.